Welcome to VanCityFutures, a new monthly column that focuses on the technological changes in the world, what they mean for all of us here in Vancouver, and the wider implications in the world. My name is Nikolas Badminton and I’m a Futurist and speaker. I have been working in the software, R&D, management consultancy, and advertising worlds for over 18 years. I write and speak about how the world will change in the next 5, 10, and 25 plus years. This column will provide new insights to the ever changing world for you. We’re kicking off with a focus in on the buzz around what is happening with the rise of the app economy and how the sharing economy is changing how we consume and share. In 2007 Steve Jobs took to the stage to announce the iPhone that “changes everything”. Then in 2008 he introduced the app store and changed every facet of how we interact. Benedict Evans, from the Venture Capital firm Andreessen Horowitz, most recently announced that “Mobile is eating the world.” And it’s true. From 2008 until 2015 we have seen over 100 billion apps downloaded from the Apple App Store alone. Pick up your phone. You’re likely to have 20+ apps sat right there vying for your attention. It’s ingrained in our culture. If we just look at Facebook and it’s movement into mobile then we see two of the biggest revolutions to have hot the world. They bought Instagram for $1 billion in 2012 (that was more than the market cap of the NY Times at the time) and changed the photography landscape forever. They now have over 400 million users uploading photos. They then bought WhatsApp for $19bn last year (in stock and cash) and now drive the enablement of over 7 trillion messages each year. And they are free to use for all. But, I think the biggest advancement is beyond filtered pictures, selfies, social networking and communications. It’s in business and the systems that help us run society. It’s an exciting time and also a double-edged sword. The Sharing Economy (also know as the Collaborative Economy) is an economic model in which individuals are able to borrow or rent assets owned by someone else. The sharing economy model is most likely to be used when the price of a particular asset is high and the asset is not fully utilized all the time (definition courtesy of Investopedia). Many entrepreneurs have realized is that there is a huge opportunity to take some of the things that we have available and make them accessible online and they have developed mobile apps and web platforms to help us all connect. Doing work as a freelancer, renting your home as a landlord, driving your car as an on-demand taxi driver, offering your possessions to be borrowed for a few hours, and offloading unwanted goods for sale online are all commonplace these days. The world has dropped barriers of entry to many things on all levels. This video provides a little story that illustrates this nicely. And, this just scratches the surface. There are many things that can be shared and services that can be easily connected with. 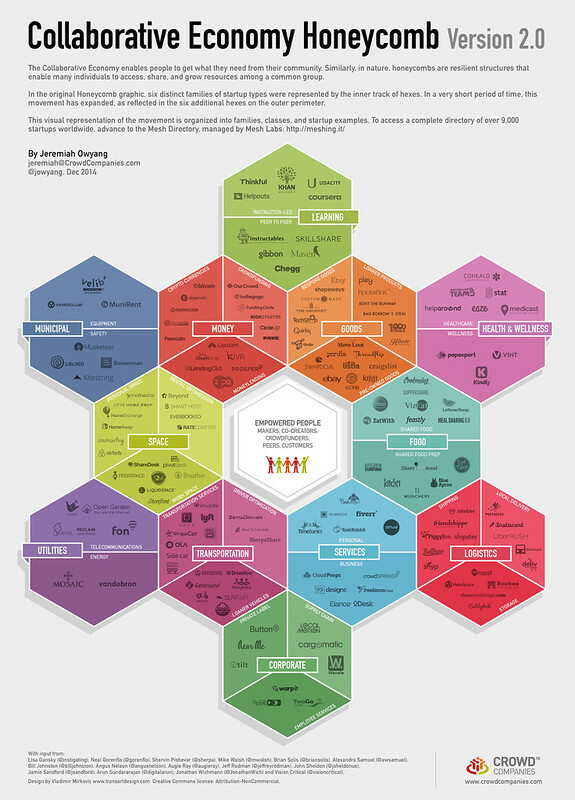 The team down at Crowd Companies have compiled a list in their Collaborative Economy Honeycomb. We used to live in a world were there people, private citizens, a world where there are businesses, and now we’re living in a world where people can become businesses in 60 seconds. 1. Start your own company and run it from wherever you are. If you have a smartphone and credit card you can build your business from your home or even on the road. You can get a website up and running using freelancers, start an eCommerce business, or whatever online. And now you have all the tools you need to get going. You could even just drive an UBER (if you’re not being stopped by Municipal government) to augment your income and stay in and AirBNB as well. 2. Be more creative and take your passion projects to the next level. Maybe you’re an artist or create amazing jewelry then sell it on Etsy? Maybe you find amazing clothing at thrift stores and flip them on eBay? Maybe you are a designer that freelances from the beach in Bali on freelancer platforms? The world is your oyster. 3. Balance out the cost of living by sharing what you have. Share your bike, your home, your couch, your care, your tools, or whatever. So many things are lying around doing nothing for us. Time to monetize them and maybe have a little extra cash on hand. Many in Vancouver let lidgers pay their mortgage. A great tool to get on the property ladder! This can be a little scary however there is a lot of opportunity for those ready to embrace the App and Sharing Economies. Time to experiment and create a new way of living. You can hear more on this subject in this conversation I had with Lynda Steele on the CKNW here in Vancouver on October 5th, 2015. The Future of Work: Go With the F.L.O.W.